Can was very good at getting to the root of riding problems – which are all mostly between the ears. Mental challenges then usually lead to the other issues – line choice, brake points, exits, etc. I also realize there is a bunch I don’t know, but as Coach encouraged me, “You have room to improve!” Coach’s attitude and knowledge are awesome. Very patient and encouraging, while also being honest. Can spent a Saturday afternoon helping Anthony and two other kids at Stockton this past Saturday. To protect himself from the “soccer-dad” syndrom, Can asked parents to stay away and let him work alone with the kids. 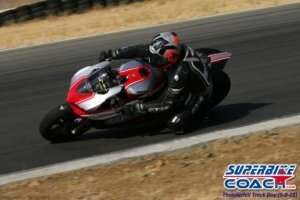 Just took the Superbike-Coach’s road skill class. I’m not great at writing reviews but will say that it was more then worth the money.